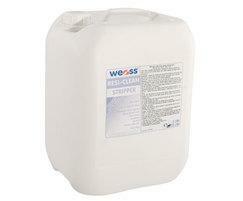 Weiss RESI-CLEAN available in 1L, 5L and 10L bottles. Weiss RESI-CLEAN is a solvent-free stripper that removes paving sealants, graffiti, paint, varnish, polish, bitumen, tar and adhesive residues from natural stone and concrete surfaces. It draws out deep stains and sealants whether they are water-based, acrylic polymer, epoxy/resin and other organic solvent-based. It is safer, less volatile and more environmentally friendly than solvent-based cleaners and strippers. Cleaned surfaces should then be impregnated with a water-based impregnator such as StainProtect PROFI to guard against future staining.